Way back in the mid-80s while in the USA, I had a chest x-ray which showed a small nodule in the lower right lobe of my lung. Nothing ever came of it. Two years ago another x-ray also showed a small nodule in the lower right lobe with no follow up. Back in August or September 2014 I was diagnosed with non-small cell cancer of the lower right lobe. The nodule measured 2.6 cm. One oncologist said I had stage 3 or 4 lung cancer and wanted to put me on chemotherapy right away, before consultation with the center's radiation oncologist and biopsy of lymph node or a chance to get a second opinion. Biopsy came back as benign. Radiation oncologist said it was stage 1. On Feb. 18, I had the first of five radiation treatments. Would have had second treatment today but problem with a pinched nerve left shoulder forced me to stop treatment until the 23rd. What surprised me the most, was the lack of consultation between both oncologist at the cancer research and treatment center and myself, the patient. My 92 year old maternal aunt was diagnosed with advanced lung cancer last May 2015. Due to her advanced age and other co-morbidities no treatment was initiated other than continuous oxygen therapy. She declined any further work up so oncologist discharged her with instructions to contact him if she needed him. She has now developed a cough which she describes as 'not like a cold'. My sister and I are wondering if this means the cancer is advancing. Our mom (her sister) died of lung cancer in 1969 at age 51. And our uncle (their brother) died from same disease 3 years later. We know we can't keep our aunt forever but wonder how to proceed in light of this new symptom. I am 43. 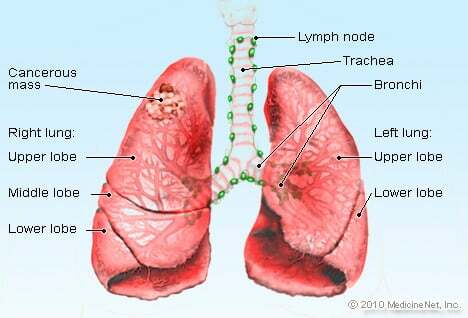 I had the CT scan for something different and a little nodule was seen in my lower left lobe of the lung. A biopsy revealed it was cancer. I had the tracheotomy and reduced left lobotomy along with a small wedge resection of upper left lung due to another smaller nodule. I had no lymph involvement. I have the suspicious cloudy opacity around my upper right lung that's being watched. Overall, the surgery in addition to recovery have eliminated cancer well, although the tracheotomy is usually an unpleasant and painful recovery even if everything goes very well. I am due to go in regarding another CT search in January to see or watch any changes inside upper right lobe; surgery may be considered and I am about to ask about the biopsy which will never be done. I imagine the 'wait in addition to see' approach is actually questionable, especially with lung cancer. My husband was told he had lung cancer. He had no signs at all, he went for a checkup and that's how we found out. They told us the only thing they could do was prolong his life and told he had about 12 months to live. As they said, he had had the cancer about 18 months; that was 19 months ago and he is still going strong. So you should never give up. It is my sister who has lung cancer. We were told on February 4th that she had two tumors on right lung and that she was too fragile at that point to do any chemotherapy or surgery. She was a heavy smoker, now living in an assisted home. I am here visiting. The doctor gave her from 10 days to maybe a few months. I live in another state and have been here in Ohio for a week caring all I can and crying. I don't feel they are giving her the care. They drop off food in morning and it stays cold so I reorder and feed her when she eats. And it feels good because they told me she couldn't swallow. She is doing fine if given care. When she says she has some leg pain, they give morphine, she doesn't say she has that kind of pain. I feel they just want her to go. I wash her face and brush her hair. I have stage 3B lung cancer and they said it was incurable. I have late stage 3 cancer in lungs metastasized to liver. It was found accidentally when I went into the hospital after total knee surgery. I had a pulmonary embolism and they found a 4-mm pulmonary nodule. I now get scans every three months. I also have chest pain and shortness of breath. They did a scan to rule out another PE and found two more nodules. I have been extremely fatigued and have had a cough for three months. I'm wondering what my chances are of developing lung cancer. How effective was your lung cancer treatment?